Award winning entrepreneur, bestselling author, speaker, and founder of ClearVista Consulting International, Rosie Aiello champions female entrepreneurs and professionals to realize their dreams and vision with clarity and focus. She loves defeating productivity black holes and small business overwhelm. With her proven programs, Rosie empowers her clients to organize and value their time, resulting in higher profits, less stress, and more freedom to enjoy fulfilling lives. 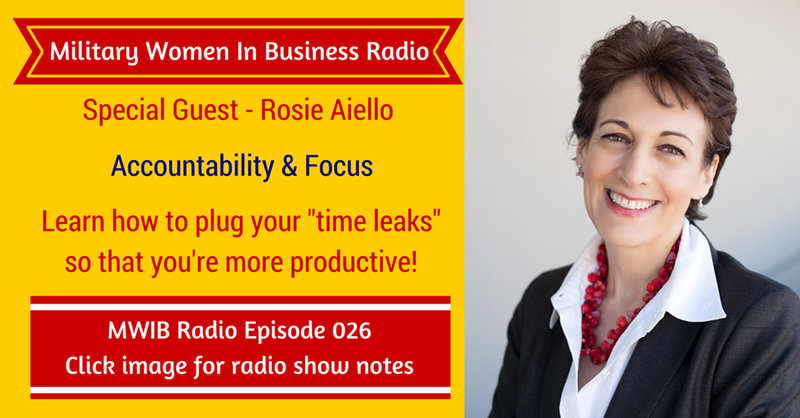 Click to tweet on Twitter: Rosie Aiello shares how to plug your “time leaks”! …figuring out what your priorities are. Not everything can be a priority, because we can only do one thing at a time. Unfortunately, we only have 24 hours in a day and some things are just more important than others. To get the highest and best value of your time is to focus on income producing activities or project activities that will help you achieve your business goals vs. busyness activities. Here’s a great mantra that Rosie shared: “Am I working on a task or action that is helping me achieve my goals?” Use this mantra when you’re overwhelmed to help you focus clearly in your business. Takeaway #2: Time Is Really Money! Working on a project until you finish it is a recipe for disaster. It’s very difficult to finish a project because it’s too big. And when you don’t finish the project, you feel defeated. Finishing a task is better than trying to finish a project because a task is small and measurable. They key to finishing a project is to break everything down into measurable tasks; even if it’s one phone call or writing an email. This allows you to celebrate, feel successful, and continue with the other tasks that you need to complete. Oh, and using a timer to be effective is not an old wive’s tale. It helps you stay on task when facing something difficult. Special thanks to Rosie for joining me this week. Until next time!